Backpackers.com — The confluence of the outdoors and technology has been a long, steady upward curve. Some may call it an exponential explosion these days as all manner of gadgets, new-fangled materials, and ever-connected social media campaigns dominate the wilderness world. This proliferation has (of course) made its way to smartphones. Nature-focused apps can be downloaded in a single touch and include all manner of backcountry guidance, like detailed hiking trips and mileage-based workouts. There are also apps that correspond to physical hardware, like fitness trackers and emergency beacons. Another type of app exists as well: National Parks guides. National Parks are the purest, simplest, and most coveted outdoor locations in the U.S. — they attract millions of tourists yearly and remain one of the best and most comprehensive conservation efforts in the world. Most people want to drive through a National Park, car camp, and hike some epic trails. Chimani takes the concept of a National Park app to the next level. Chimani actually introduced its National Park app in 2011, and even then it was pretty comprehensive. But the most recent release has seen a major user interface update in addition to complete guides to all 59 National Parks. This makes for over 411 points of interest within those Parks, including Seashores, Monuments, and other destinations. The company has released one overall app, called National Parks by Chimani, that has a list of every National Park, incredible photos of those Parks, and basic information for each one. You can download this app as a starting point, or if you just want to see an interactive map of where different sites and Parks are across the U.S. The real goldmine is in the 61 individual apps made for each National Park, with two additional apps for historic places. Each of these can be downloaded separately and contains a huge amount of information, including hiking trails, camping sites, photos, and more. 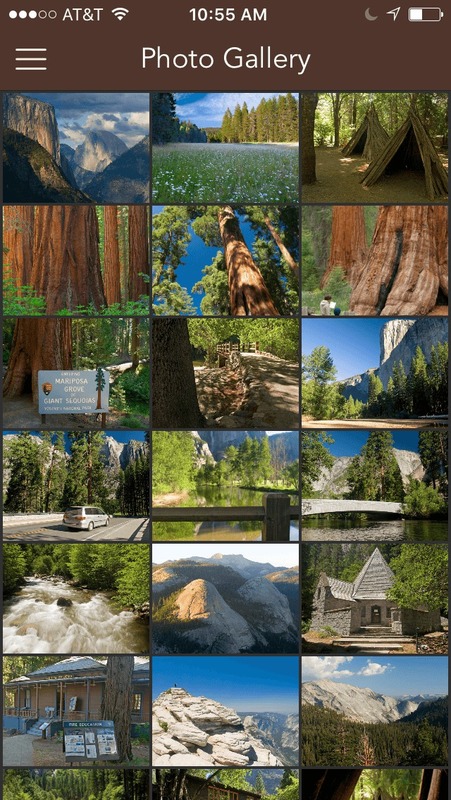 In short, if you want to know about National Parks in general, download the general app. If you are planning a trip to a specific National Park, or heading into the Park itself, download the specific app. The best part? Every single app is free. Free as in no cost, charge, or ulterior motive. There’s also not even that much sponsored content within the apps, so you won’t feel bombarded or sold to. We review and highlight aspects of the Chiman National Parks App below. Internet-based tech and the outdoors has never really got on together because there’s rarely service way out in the woods. Who wants service out there anyway? Chimani’s main feature for its 61 National Park Guides is that they’re all accessible offline. You can download every aspect of the app to your device so that it’s fully accessible in the wilderness, which enhances the usability significantly. While the photos and various written details are excellent (and written by Chimani, not the NPS), the real benefit of this feature is the maps. Chimani provides a full detailed map of every National Park, which is downloadable and functions within the app seamlessly. These maps are easy on the eyes and contain tons of points of interest, including detailed trails. Using GPS from your phone does not require a data connection, so you’ll always be auto-located on the map if you’re in the park. The maps are built on the OpenStreeMap platform, an open-source resource. You can download large, fully detailed maps of each National Park, or smaller, less detailed versions. The two different map sizes will effect the speed and size of your download. The one drawback to the offline aspect of these apps (and maps) is that they take up a lot of storage space on your phone. A high-res map of Yosemite National Park has over 30,000 individual map tiles, which will result in a good chunk of space. Even on Wi-Fi, the download takes a while. If you plan to use the offline feature of Chimani, download it at home before you leave for your trip and make sure your phone has plenty of storage. Going into every feature these apps offer would require thousands of words, and very people would read through all of it. So, instead, we’ve highlighted the best features offered in the apps, and those individuals will use the most. In general, every single feature has a specific symbol, and that symbol is the same as the symbols used by the NPS. 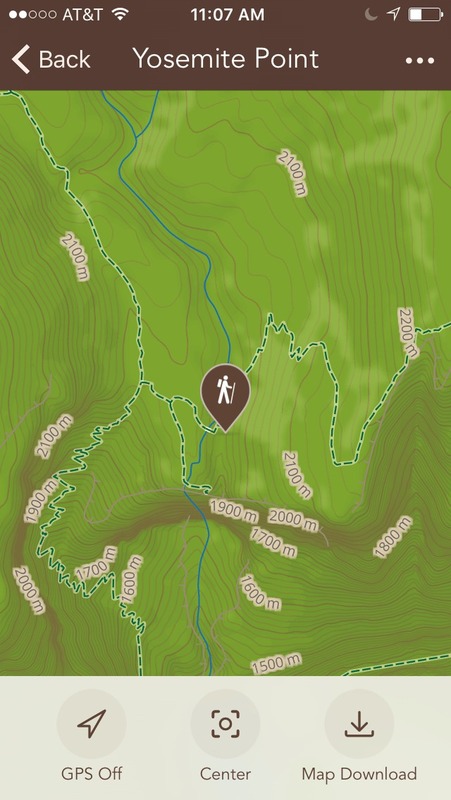 So the person-hiking-with-stick in the app is the same as the hiker’s trail sign the NPS uses. This is very nice aesthetically for easy and quick recognition, which the brain does automatically. You’ll also see that every map, depending on what part of the app you’re in, will list each individual point of interest with a pin. That pin will have the symbol, so you know what type of activity you’re about to click on. You can seamlessly pinch and zoom around every National Park map to peruse different points of interests, or do it for specific interests, like hiking. This one will be the most popular feature of every app. Each app that is specific to a National Park contains a list of trails. Each set of trails is split up into different geographic areas of the Park, or you can look at a map of the park and pick from a clustered set of trails or individual pins. You’d think all of this information would take up a lot of space, but it doesn’t. Everything is accessible and scrollable, with no trail taking more than a minute to read through. The app also includes a huge variety of hiking trails. In Yosemite National Park, you can find the description for Mirror Lake, an easy walk to a picturesque lake, in the same area as the John Muir Trail, a 211-mile thru-hike that can take a month to traverse. The JMT runs through this particular section of Yosemite, so the trail is only technically for that leg of it, but the breadth and scope of this information is excellent. Let’s face it: the U.S. National Parks are beautiful. It’s why we want to go to them. The Chimani National Park apps have stunning images of every National Park, every trail, and every major point of interest for you to scroll through at your leisure. This doesn’t matter so much when you’re in the park and staring at the real thing, but for planning purposes, or long car-rides where you need to provide stoke for the family, this is a great resource. Just open the photo gallery of the National Park you’re visiting, scroll through, and find the thing you want to see. There are lots of apps that boast trip planning ability, but the reality is it’s hard to cover every base. There are just too many variables for any app to provide complete functionality, but Chimani does a decent job. Trip date. The starting date. Length. You have a choice of a few hours, a day trip, a weekender, or a week or longer. Interests. This is pulled from Chimani’s searchable activities, and includes things like biking, climbing, hiking, and educational. Type. This is about your group — family, relaxes, solo, intermediate, or expert. As you can see, the list is full of great hikes and campsites that fit all these parameters. The trip is then saved in the app, which means you can revisit a trip at any time. This system is not perfect, but for those wanting a basic trip planner, it works extremely well. This is one of the most useful features of the apps, and one most organizations get wrong. When you click on Information in a specific National Park, you’ll be presented with a grid of different points of information, like Operating Hours, Fees, and various services. Some of these are basic and need-to-know, like Fees. Open this up and you’ll have a detailed description of fees in Yosemite National Park, presented in full sentences. There is also information about general categories, like seasonal visiting, camping, shuttle buses, and wildlife. This section is incredibly detailed for each National Park, and serves as an excellent reading resource. These apps are so detailed that it’s almost as if there’s endless information. We know that’s not possible, but it sure feels like it. 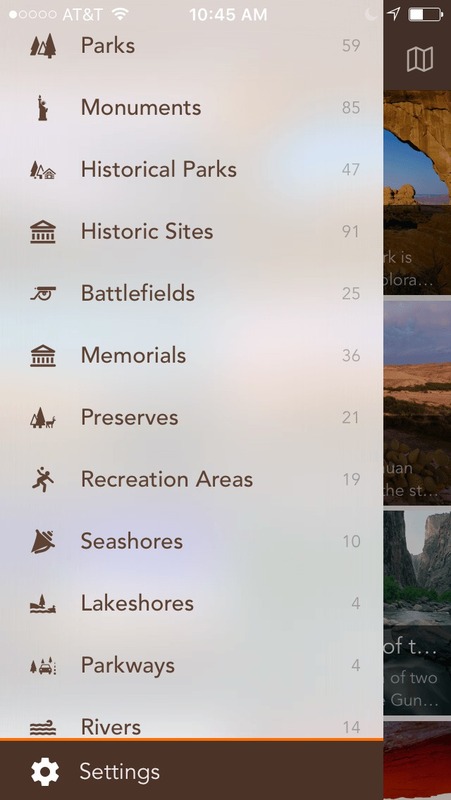 There are 37 total categories in each National Park app, all of which have various points of data. Some places only have two official points of data, while some have more than 150 specific points. Basically, almost every piece of information is in this little app, which is available for free. The navigation is pretty seamless, though a little slow. Everything is presented in squares and moves from screen to screen, which can take time to read through. The descriptions are very detailed and clear, which means they also take a while to read. If there’s any major drawback to the app it’s just how much information there is. It might actually scare off some basic users. But we feel that the whole point of a project like this is to get all the information out there. If it looks daunting at first, just focus on one National Park and one specific activity. At the least download the map so you can use it while you’re there, instead of buying the super expensive water-resistant map at the gift shop. For those wanting an upstream of information on any National Park, download one (or some) of the Chimani National Parks apps. There’s literally nothing to lose, and if you don’t like the app you can always delete it. Chimani doesn’t have pop-ups, annoying advertisements, or try to sell anything hard. There is a “Chimani Gear Store” tab at the very bottom of the menu, in which you can buy branded Chimani Gear. But it’s so far down in the list you don’t even notice it unless you’re writing a review. The app is presented in conjunction with Subaru, so that’s where a substantial part of the money is coming from. You can download any of these free Chimani National Park Apps for Android, iOS, and Amazon, and you can use the interactive map on your web browser. Stoked? We are too. Enjoy your next National Park visit.